Published on April 20, 2014 by Martyn. Be the first to comment! 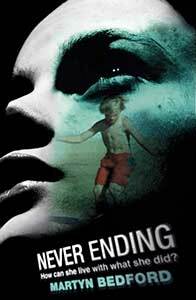 Never Ending by Martyn Bedford (Walker £7.99) is concerned with a teenage girl’s attempt to escape her lot. Siobhan’s family is close and loving, and their holidays together indulgent and laughter-filled, until the last one in Greece, when Siobhan builds herself a secret life with a local boy, and tragedy follows. An account of her journey through a residential therapeutic regime is balanced with the memories of the family’s final summer together. The pace is perfectly judged so that readers leaf through the holiday album with breath held.